The new four-seater BMW 4 Series Diesel Coupe is the svelte, slightly more practical of the convertible variant. It’s got a fantastic range of engines to offer and its driving experience is virtually unparalleled in this class. A real driver’s car, the 4 Series has recently been given a bit of a makeover so that it’s now more stylish and can boast a better interior. And if personalisation is your thing, there are plenty of colours to choose from. OSV takes a closer look at what it’s all about with our 2018 BMW 4 Series Diesel Coupe review. Being based on the 3 Series means the 4 Series is hardly going to be underwhelming to drive. But in fact, it drives even better than its sibling and is the four-seater Coupe of choice if driving fun is your top priority. 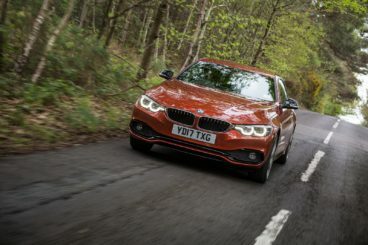 It’s got enhanced suspension settings and a lower centre of gravity that sets it apart from the 3 Series, while an optional active suspension system serves to stiffen things up – and not at the expense of ride quality. The steering, meanwhile, is alert and sharp as ever, and body lean in bends is minimal. In terms of the engines, BMW has done a stellar job at producing engines that are powerful, fast and economical. In fact, it’s almost unbelievable how good this blend is. Even the entry-level 420d diesel model can get you from rest to 62mph in 7.3 seconds. It’s smooth enough, although the manual gear lever can be a tad noisy. The 430d diesel model is a lot faster and can rocket its way from a standstill to 62mph in just 5.5 seconds. Then there’s the xDrive four-wheel-drive 435d diesel model that covers the 0-62 sprint in 4.7 seconds. Apart from the M4, this is the quickest 4 Series in the range and its six cylinder engine is both quiet and smooth. Usually, we recommend a manual transmission for a car like this, but in this instance, we prefer the 8-speed automatic ‘box. It lets you take control yourself, is nice and smooth, and comes standard with the 430d and 435d models. On the other hand, some buyers might be disappointed that neither of these models can be specified with a manual ‘box. All models can be specified with four-wheel-drive for extra grip, although the system will have a negative effect on running costs. It’s hard to find too much fault with the BMW’s cabin. It’s classy, comfortable and nicely insulated. Again, being based on the 3 Series means it was always going to be hard for BMW to put a foot wrong here. The materials used are of a high quality and the comfortable driving position combines with the Adaptive Suspension to offer a relaxing driving experience when you just want to cruise. The dashboard was recently given a revamp, and there is now more gloss-black trim and chrome detailing. It’s just as sharp as it was last time but some buyers might be put off by how business-like it is compared to rivals. That said, it’s typically BMW, which means a logically arranged dash, tablet-style central screen and the brands iDrive control system. Is the BMW 4 Series Diesel Coupe practical? It’s got plenty of space for four adults and is one of the most usable coupes on the market. It’s much bigger than, say, an Audi TT, and accommodates its passengers well. The driver will be just fine thanks to wide adjustability, while storage spaces include a good-sized glove box, a few cubbies here and there and some slender but large door pockets. Headroom is good up front, as is visibility, but the sloping roofline does impinge on rear seat headroom somewhat. The boot, meanwhile, measures 445-litres. That’s reasonable but not best in class. Its opening is nice and wide but a high lip will be frustrating. Moreover, split-folding rear seats are not standard. Standard equipment is decent across the range, with entry-level models getting rear parking sensors, heated seats, bright xenon headlights, a DAB radio, cruise control, leather seats, Bluetooth, dual-zone climate control and sat-nav. All models come with the brands Drive Performance Control system too. The Sport model adds a 3-spoke sports steering wheel, sports seats, ambient lighting and bigger 18” alloys. In terms of how safe it is, this model is still to be crash-tested by Euro NCAP, but the car on which it’s based – the 3 Series – scored all five stars, and we’d expect the same from this one. Its standard safety kit includes ISOFIX child-seat mountings, tyre pressure monitoring, electronic stability control and lots of airbags. There are a lot of extras to choose from too, including a head-up display, active cruise control and lane departure warning. Prices for the new car start out from £33,985 and rise to £48,655. For more information on our leasing deals, you can check out our page here. In terms of its running costs, the 420d is the most economical model. It can return 62.8mpg if you stick with the manual ‘box and 65.7mpg if you pay extra for the automatic, which has a BiK rating as low as 21%. The 430d model offers far more power, however, and still returns a respectable 55.4mpg. Meanwhile, the range-topping 435d model is good for 50.4mpg and has a BiK rating of 29%. Insurance-wise, the 420d model is the only one that sits in an insurance group under 30, with the 435d model occupying group 41. It’s the sharpest looking 4 Series in the range. It’s also the sharpest to drive that benefits massively from the rear-wheel-drive layout. Lifted straight from the top drawer, the engines are powerful and quick. Rivals can boast more high-tech gadgets. It’s really easy to spend over £40,000 on this coupe, after which you’ll be lumbered with a £320 yearly tax surcharge. 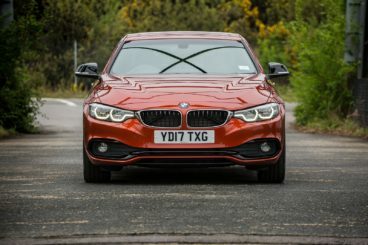 Let’s see how the car fares against its rivals in the comparison section of our 2018 BMW 4 Series Diesel Coupe review. The new Mercedes C Class Diesel looks stunning, drives well but will cost an arm and a leg. It’s true that you get what you pay for and there we have no doubts regarding the Mercedes’ on-the-road credentials. New software has been installed to make the steering weightier and faster than the saloon variant, and it’s also provided more feedback. That said, the Mercedes is still set up for comfort first, fun second. This means the BMW should still be the weapon of choice for enthusiasts. 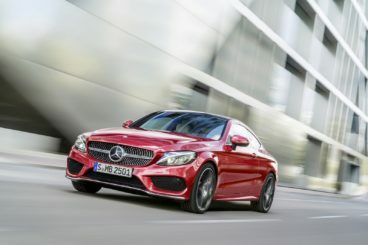 Buyers get to choose between a 6-speed manual ‘box or a brand new 9-speed automatic, while the engine range kicks off with a C220d diesel model. It develops 168bhp, has a 0-62 time of 7.5 seconds if you choose the automatic gearbox, or 7.8 seconds if you stick to the manual. The C250d diesel model will be more attractive to most buyers with its 0-62 time of 6.7 seconds and its impressive pulling power. However, it is a bit on the noisy side, which is at odds with the overall relaxing nature of the car itself. Running costs? Because both diesel models are powered by the same 2.1-litre engine, there isn’t much to separate them in this area. The C220d model returns 68.9mpg, while the bigger C250d model is good for a 64.2mpg economy. Inside, the C-Class Coupe is just as plush as the estate and saloon variants and looks like a carbon copy. That’s no bad thing, of course, because it means you get a cabin that’s comfortable, well-built and smart. The materials used are top notch, the detailing is upmarket, while all models get standard sports seats – one of the few things that distinguish it from the saloon and estate variants. Is the Mercedes C Class Diesel practical? It lacks rear doors, which means accessing the rear seats will be tricky but it’s still a fairly usable coupe. Space up front is just fine, but anyone sat in the rear will find themselves a bit more restricted by the sloping roofline. However, this is part and parcel of all cars of this type. The boot, meanwhile, measures 400-litres, which is smaller than the BMW and smaller than most other rivals in this class. 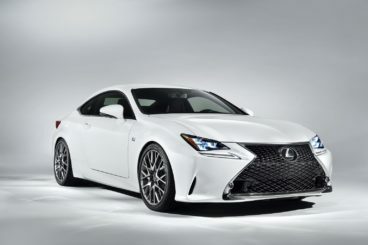 The new Lexus RC is a stylish, quiet and well-built coupe that can claim to be almost as luxurious as the BMW. However, there’s no diesel engine available. The Lexus does a lot of things right but it also does a lot of things wrong. One area where it can’t quite compete with the BMW is driving fun. Thanks to its sheer size (it’s some 170kg heavier than the 4 Series), it’s just not as agile as enthusiastic drivers would have hoped. Moreover, it lacks the option of a manual transmission. That said, it’s a competent motorway cruiser that’s well-insulated, refined and smooth. These are Lexus bywords, while the powertrains are Lexus stalwarts that are also found in the IS Saloon. A 200t model is powered by a turbocharged 2.0-litre four-pot petrol engine that develops 241bhp and has a 0-62 time of 7.5 seconds. When you consider how big this coupe is, that’s pretty good. That said, the 8-speed automatic transmission slows it down and it’s just not as slick as the 4 Series. Rounding off the range is a 300h hybrid model that takes 8.6 seconds to complete the 0-62 dash. It’s slow, its gearbox will frustrate and it’s also quite noisy. Running costs? Without a diesel in the range, the noisy hybrid is the most frugal engine, returning 57.6mpg while emitting 113g/km of CO2. However, we think those numbers are optimistic and instead you’ll probably average 41mpg. That still makes it cheaper to run than the 200t model, which returns 38.7mpg at best according to Lexus. Inside is where the RX excels. Its interior is borrowed from the IS Saloon and this is a good thing. Everything is solidly put together, fit and finish is excellent and the materials used are of a very high quality. Sure, it lacks design flair but there are plenty of neat touches, including swipe ventilation controls and interior lights, strips of white ambient lights and a large 10.3” screen. All models get leather upholstery, too. Is the Lexus RC practical? Space up front is fine but space in the rear is so limited that anyone who’ll be travelling with rear seat passengers often should stick to the BMW. The boot is much smaller than the 4 Series, measuring just 374-litres if you choose the standard model and 366-litres if you opt for the hybrid. Overall, it’s hard to make a case for the Lexus over the BMW. Sharp on the road, easy on the eye, this is a fantastically entertaining car that, despite having just the two doors, is also family friendly if you need it to be. All its engines cover the 0-62 stretch faster than 7.5 seconds, the two rear seats are very usable and if you spec it carefully, it’s pretty damn affordable. In short, the BMW 4 Series Diesel Coupe is an excellent four-seater.